Yesterday’s post displayed a very important zone that indicates a major trend decision in Bitcoin. And for that matter, the entire cryptocurrency asset class. What happens between now and around March 21st will determine the next major move of this asset class. One of the major conditions of that confluence zone was met this afternoon. 1. There are two areas I want to call your attention to: The thin horizontal line below the last candlestick and the blue arc also right below the last candlestick. The horizontal line represents a strong Fibonacci line within a Gann Square. The arc represents a very important and powerful support zone. The arc needs to act like a shield on Star Trek. Price needs to be rejected from this area in order to have a continue bullish bias. If it does not, then we are most certainly visiting much lower price ranges. 2. This green trianglular shape is a Gartley Pattern called a Bullish Shark. 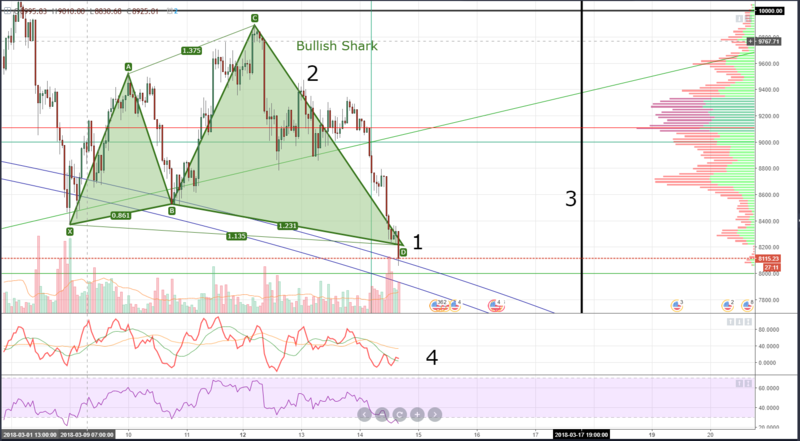 The Bullish Shark tells us that a change in trend can happen very soon. 3. This is the end and beginnings of a Gann time cycle. We also have a New Moon setup coming on the 17th of March. Additionally, we have the end of a 90 day cycle from the all time high. the 90 day cycle is a very, very powerful time cycle that indicates very high probabilities of trend changes. I can not overstate the power of that 90 day cycle. It is the most powerful division of a one-year cycle in Gann’s theories. 4. The Composite Index and Relative Strength Index show divergence and oversold conditions. Without looking at any of the other technicals on the chart. The most important one for a Gannalyst like myself is that 90 day cycle. To me, it means we will reverse course at the 90-99 day mark. Edit Note: Some questions regarding the price levels before the forecasted date have been asked. The answer is: it doesn’t matter. In a Gann time cycle, the price is irrelevant to the future direction. For me though, the lower the better.